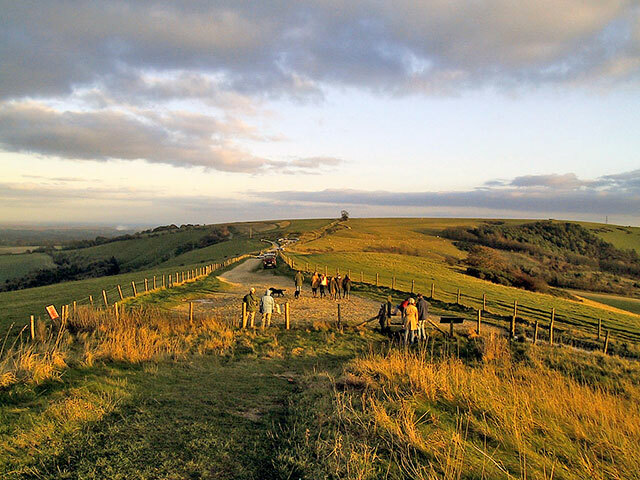 Combe Gibbet is number 25 in 100 greatest hills. It is a fairly short climb, averaging just under 10% to take you to the top of Combe Gibbet / Walbury hill. I rode up Combe Gibbet on Sunday purely by accident. I was racing up Walbury hill which is an alternative ascent to the top of that hill. The weather was too hot to warm up on rollers so I preferred to warm up on roads instead. I took the road from Inkpen and went in any direction that was uphill and not on the race course. From Inkpen there is a gradual ascent, and then a bit of downhill before the short, sharp shock of Combe Gibbet. It averages 9% for 0.5 miles. But, towards the end of the climb, there is a good section of 16%. Pre race I was trying to ride up the climb, without going over 300 watts- which is a bit difficult to do without going at low cadence. I don’t like warming up too hard, I prefer to keep it fairly steady. The weather was perfect so I enjoyed the climb and view from the top. The climb was quite quiet, very few cars, and the odd horserider. If I’d known I was riding Combe Gibbet I may have taken some photos. But, I also had a race to concentrate on. After the race I went back up Combe Gibbet to do a bit more training. From the top of the hill, I headed south in the general direction of Andover. It was a strange descent, you kept thinking you would come to the bottom of the descent, but it kept on going down. One thing about hills in this part of the country is your never sure where the starting point is. It’s a great part of the country to cycle around. Quiet lanes, interesting roads, decent climbs, but nothing too taxing. Combe Gibbet is a popular tourist attraction. Wikipedia tells us a gibbet was erected in 1676 for the purpose of gibbeting the bodies of murderers – George Broomham and Dorothy Newman. The gibbet was placed in such a prominent location as a warning, to deter others from committing similar crimes. So if you want to see a replica of a Seventeenth Century Gibbet, there’s an added motivation to climb the hill. Walbury hill is the highest point in Hampshire. Combe Gibbet from the south is a good climb. If you want there is a several mile incline averaging about 1%. But, the climb proper only lasts for the last 1km.